Add fat to frying pan and turn heat to medium/low. Sauté shallots until they begin to turn translucent and soften. Increase heat to medium and add mushrooms. 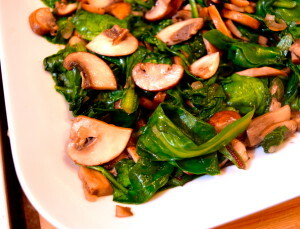 Cook mushrooms until they begin to soften. Add greens and allow to wilt into the shallot/mushroom mixture and become tender. Note: excess liquid may form from greens and can be discarded or used as a sauce.